Upon reading the following article, the above response sprang forth from our ever present musical mental meanderings. Mary AnnÕs story reviews our faith Ð too often jaded Ð that out there still are fairy tales with happy endings. To accentuate the positive read on for your full ration. In the Andes of Peru in 2005, sweet sounds from a distant recorder caught my attention and captured my heart. At home not long after, a newspaper article captured my attention and stimulated me to inquire about a Suzuki recorder workshop at the Community School of Music and Art (CSMA) in Mountain View. Leslie Pont, whom I already knew, invited me to go with her. Soon after, I began lessons on soprano recorder at CSMA with Sally Terris, who is a terrific teacher in all respects. In time, both Leslie and Sally told me about MPRO. But I didnÕt feel ready. Instead, I got together with Leslie, David Cole and our mutual friend and pianist, Trudy Stevenson. It took some searching for music, but eventually we developed a repertoire for soprano, alto and tenor recorders plus piano. We named ourselves the ÒAlmond Street QuartetÓ and played at some CSMA recitals. In truth, we practiced on Almond Avenue in Los Altos, but ÒAlmond StreetÓ had a better ring to it. Sadly, we disbanded our quartet in December 2010 because David left for Portland, Trudy moved to Stockholm, and the Almond house was sold. We are looking for a recorder workshop in Sweden or Iceland as a way to rendezvous! Meanwhile, in September 2009 after five years of lessons, I did join MPRO. Leslie eased me into it, Stevie took me under her wing, Fred made me feel welcome, everyone was friendly. I participated in my first concert in June 2010. By that time, both Fred and Sally were giving me clues that I should learn a second recorder. After weighing the pros and cons of alto vs. tenor, I settled on alto. Will I ever stop mixing them up? I also play Scandinavian and Bavarian folk music on a button accordion with a couple of small groups. But MPRO is my first experience working with a conductor and playing in a large group. I am grateful for this terrific opportunity to work with Fred and the orchestra, to learn more about music, to meet new people. I am especially appreciative of the friendly and supportive attitude of Fred and the orchestra members. Listed below is the music for the orchestra's next two meetings. Please note that there will be sectional seating for Sonata La Margherita, with those in Coro Primo sitting on the right as they face the conductor and those in Coro Secundo on the left. Please observe this seating arrangement when you choose your place at the beginning of the meeting on March 9. Please note as well that great bass and contrabass recorders, bass viola da gamba and harp will be needed at both meetings and sopranino recorder, dulcien as well as krummhorns on March 9. MPROÕs Spring Concert will be held at 2:00 P.M. on Saturday, June 4, at Grace Lutheran Church in Palo Alto. The dress rehearsal will be at 7:30 P.M. on Wednesday, June 1, also at Grace Lutheran Church. Put these dates on your calendar! MPROÕS WORKSHOP A HUGE SUCCESS! Music of Nations - Renaissance to Modern Workshop. Clea Galhano led the group through 10 pieces including music from Lappi, Byrd, Bach to African Freedom Songs, Israel and Brazilian pieces to Tangos of Piazzolla. CleaÕs enthusiasm kept everyone involved. Even in the difficult passages she had us sing along and feel comfortable with the music. Special thanks to all the MPRO members who attended. We welcomed many visitors from around the area. One visitor, Jay Kreuzer, played solo tenor in the modern Izi-Mizi-Dixi piece and also played harmonica on one of the tango pieces. Many others took leading parts. Stevie White for contacting the director and providing airport runs; Margaret More for arranging for church venue; Mary Ashley for delightful flyer; Chris Flake, Mary Jeanne Fenn, and Marguerite Dilley for publicity; George Greenwood for name tags and copying and organizing music; Leslie Pont for registration; Anne-Marie Wiggers for hospitality; Bill Lazar for hosting guest director; transportation was arranged with free mileage. Thank you one and all for helping make this a success. 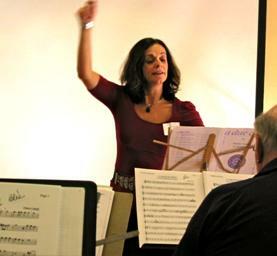 If you were one of the fourty-four attendees at the Jan. 29th workshop, you were lucky to spend the day with Clea Galhano conducting a wide variety of music with great enthusiasm and humor. Her engaging approach created a memorable event for all. Thanks go to all attendees and members of the MPRO team who put together the workshop that resulted in a very healthy $740 addition to our General Fund. On a different topic, many thanks to Lois Ario who is donating the proceeds of her music sales to MPRO. Lois and several of her friends have collected many copies of music over the years, and she is making these available at regular MPRO meetings. Please take a look at her box of music and donate if you wish. Lastly, an anonymous generous donor has agreed to match one for one any donation made to MPRO through SFEMS for the calendar year 2011. What a great opportunity to double your donations! Please keep this in mind if you are considering a donation. Make your check to SFEMS, the San Francisco Early Music Society (since we are an affiliate) and specify that the donation is for MPRO. Please give any checks to me, and I will route them through SFEMS.